From the Heartland, over three (3) pounds of tasty cheeses and sausages in a sturdy, rustic tray. Shipping weight: 5 lbs. Measures 16” x 8” x 2”. Case pack: 6. Prices shown per piece. Engraving Area: 5” x 3”. This contemporary-styled tray is both beautiful and functional and can be used for any occasion. Mailers are not available. Shipping weight: 7 lbs. per case. Measures 16” x 8” x 2”. Case pack: 6. Prices shown per piece. Engraving area: 5” x 3”. 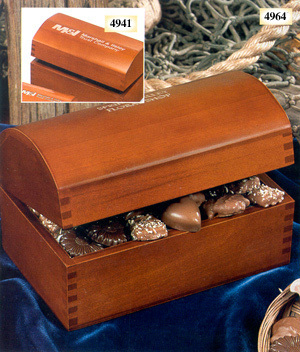 Eight (8) ounces of our homemade, award-winning chocolates are packed in this antique-style brown chest. Shipping weight: 3 lbs. Measures 8 5/8” x 5 3/8” x 5 1/4”. Case pack: 6. Prices shown per piece. Engraving area: 5” x 1”. Shipping weight: 3 lbs. Measures 8 5/8” x 5 3/8” x 5 1/4”. Case pack: 6. Prices shown per piece. 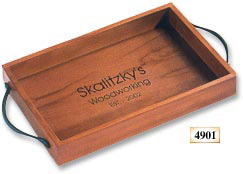 Engraving area: 5” x 1 1/2”.